Google soft-launched Digital Wellbeing with Android Pie, but it's still only available on a few phones. If you're sick of waiting, developer Chris Lacy has launched a new app that brings similar features to any Android phone. 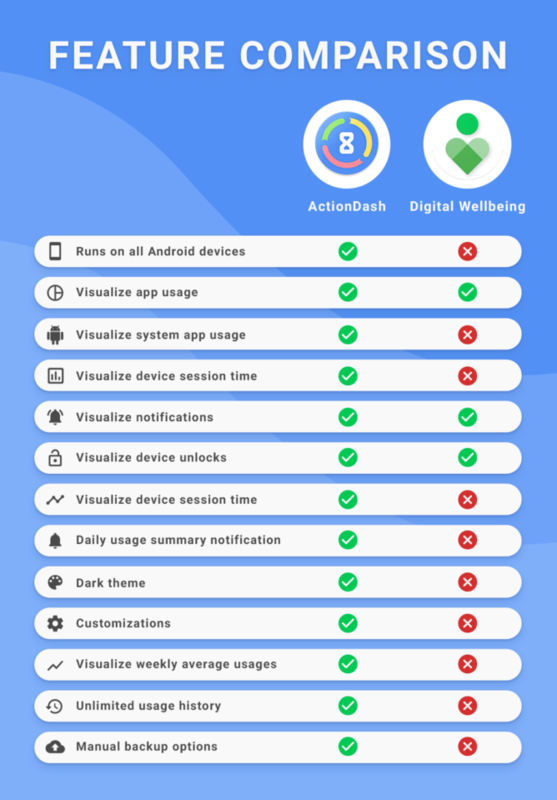 ActionDash tracks how you use your phone like Digital Wellbeing, but it includes more goodies like a dark mode, daily summaries, data backup, and more. ActionDash doesn't require Pie or any of Google's Wellbeing tools. Thus it should run on any Android device by plugging into the Usage Access feature. After installing the app, you need to tweak the settings so it can log which apps you use and for how long. That data stays on your phone unless you choose to back it up—that's the first thing that sets ActionDash apart from Google's Wellbeing tools. You can export your usage history and restore it to keep all your stats intact. There is no 7-day limit on stats in the full version of ActionDash, either. The app will be familiar to those who have used Digital Wellbeing. You can see which apps you've used, how long you've used them, how often you unlock your phone, and so on. ActionDash isn't focused entirely on helping you use your phone less—it can't do app blocking as a non-system app anyway. It can be handy if all you want is a way to better understand how you use your phone. For example, the app pushes a daily report that offers a quick breakdown of app usage and your total screen time. There are more advanced settings than Google's Digital Wellbeing feature as well. You can turn on a dark UI mode, change the start time of each day, and include system apps in your timers. ActionDash is rolling out today in the Play Store (be patient if it's not showing up yet). You can give it a shot for free with a limited feature set. The free version has ads, and it lacks the dark theme, data backups, extended stat history, and a few other things. The full version upgrade costs $6.99, and it integrates with Action Launcher if you use that for your home screen.